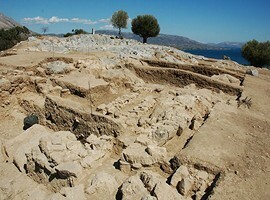 The ruins of ancient Eretria are scattered beneath the modern city, across the area reaching from the coast up to the hill at the north, where was the Acropolis. 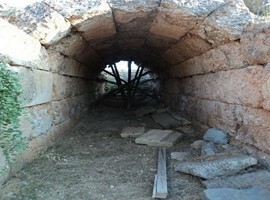 The city was protected by a strong wall, built in the archaic period and repaired in the 4th century BC. 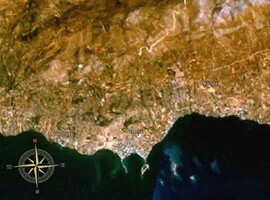 It started at the citadel and reached to the port. The western part of the wall lied just before the stream that flowed at the west end of town and at its extension there was a breakwater, which now is sunk below the sea surface. The east wall also reached to the coast and ended to a natural breakwater. Along the coast the two strands were linked with the coastal wall. 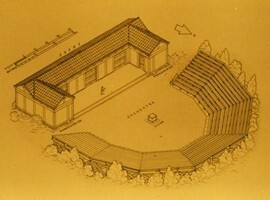 The precinct was accessible through two main gates, one on the west side and one on the east. The west gate was the oldest and largest of the city and it was constructed over the stream, along with a bridge. 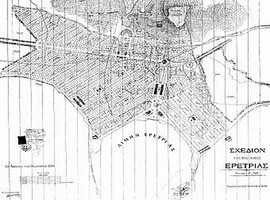 The space inside the wall was divided into three districts, eastern, western and north, separated by two major roads. 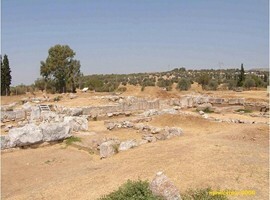 The one road in the direction east-west connecting the two gates, while the second began around the middle of the first and drove south, at the temple of Apollo, which dominated the heart of the city. South of the temple laid the ancient market square with galleries, shops, the dome-an impressive circular building-, fountains and temples. 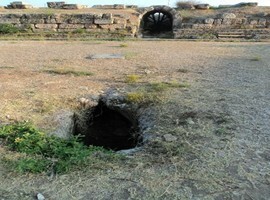 Adjacent to the southern, coastal walls there were baths of the 3rd century. 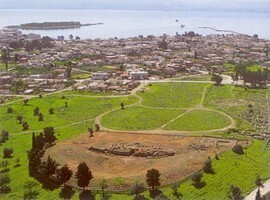 BC, workshops, warehouses and docks, while at the southwest end of town near the harbor, laid the temple of Isis and the lower gymnasium or arena, built in the 4th century BC and repaired after 198 BC. 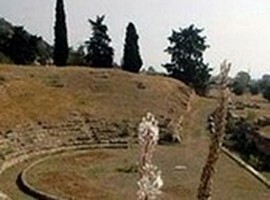 At the foot of the Acropolis hill, near the west gate, in the Geometric, Classical and Hellenistic times the western district was formed. 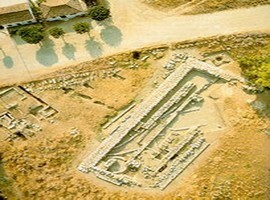 Along the west wall, south of the gate, majestic buildings are preserved including the memorial, rich burials of the Geometric period, the Palace I and II, grand houses built in the 4th century BC and a temple of the fifth century BC. 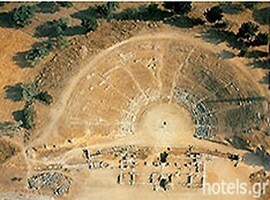 North of the gate and the road lay the temple of Dionysus and the theater, the most impressive monument of the city, built in the 5th century BC and perfected in the fourth century BC. 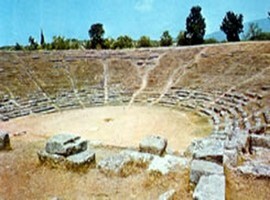 East of the theater there is the top high school, built in the late Classical period and repaired after 198 BC and the state, whose position is known from inscriptions and testimonies of travelers. 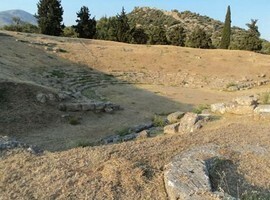 Further north, on the hillside, was the Thesmophorion of the third century BC and the Temple of Artemis, which was older, but continued to be used until the 3rd century. BC. 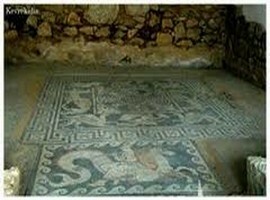 Further east, at the intersection of cross street with the other, leading to the temple, you can see the ruins of the famous “house with the mosaic,” built in the fourth century BC. 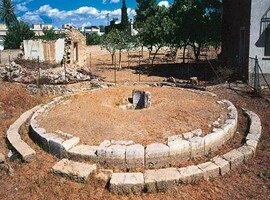 The house is a characteristic example of eretrian style houses and is one of the best preserved, while a little further south at the central district you can distinct the building phases of the Geometric and Hellenistic periods as well as a part circular building with an altar, perhaps of Hercules. 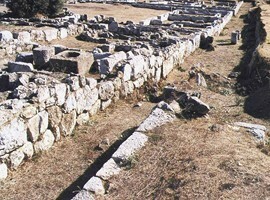 In this section also survives a strong wall, which served for a short period (800-700 BC) and ruled the north and northwest side of town. 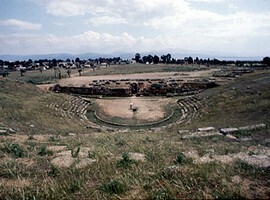 The area was used in Hellenistic times, while the western district was used until the Roman period. Outside the city walls were the cemeteries. 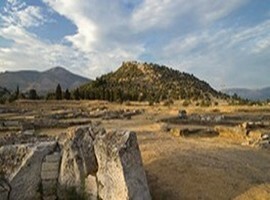 On the west side lied that of archaic years and the second was located on the east.